Do you ever think about where your drinking water comes from? In Canada we are fortunate. We have potable (drinkable) water that is generally easy to access. The majority of the population has access to running water in their homes. It is clean, generally free from pollutants and toxins and ready for drinking. That is not true in all communities. Many indigenous communities lack access to clean water. There are also other communities that depend on water sources and treatment systems that are unreliable. We are often told that Canada has 20% of the world’s fresh water supply. This number is misleading as it suggests that it is all renewable and available for our use. Less than half of it is a renewable resource and much of that is in sparsely populated areas or flows into Hudson’s Bay and the Arctic making it unavailable to most Canadians. We, nonetheless have greater access to fresh drinkable water than much of the world. Access to drinking water is a challenge in many parts of the world. China for example has one fifth of the world population and only 7% of the world’s fresh water. My step-brother lives in southern California. The state is in the midst of a prolonged drought. Climate change only exacerbates water access challenges. In addition to the drought in California, we are seeing drier weather in British Columbia and Alberta, which is contributing to more and larger forest fires than have been the norm in recent decades. Brazil, South East Asia and Australia are also experiencing serious droughts. Droughts reduce the amount of accessible drinkable water since the reduced rain fall means less water to refill lakes, rivers and aquifers. With the world’s population continuing to grow and the impacts of climate change being felt in more places around the world, we need to look for solutions to improve access to water. One option being used in many coastal regions is desalinization of ocean water. There are plants operating around the world, including China and California. Desalinization is typically an energy-intensive process that will produce additional carbon emissions both from the desalinization process itself as well as the energy required to pump the desalinized water where it is needed. Desalinization is a process which removes the salt from seawater to make fresh water available for drinking and irrigation purposes. It is also possible to desalinize water using solar energy. In fact the largest solar-powered desalinization plant in the world is currently under construction in Saudi Arabia. Kids who attend Ocean Week at Stem Camp this summer will have the opportunity to experiment with solar-powered desalinization on a smaller scale. They will learn how this process works and discuss the need for desalinization to provide drinkable water in parts of the world that lack access to fresh water. When I was a kid I spent part of my summer every year at summer camp. Those weeks always involved canoe trips along various rivers and lakes in north eastern Ontario. Almost every trip involved travelling through swamps and marshes. I remember navigating narrow, winding bands of open water through the reeds, lily pads and bullrushes. These wetlands were always teeming with life. We drifted past frogs sitting on lily pads, fish, large dragon flies, occasional muskrats, beaver dams and lodges, song birds and herons, and from time-to-time a moose walking gracefully through the marsh. The journeys through the wetlands were usually a peaceful and relaxing part of the trip. We had to slow our pace to make our way through the typically winding river. Our counsellors gave us time to observe the life around us. The water was calm and we didn’t often have to work against the wind the way we frequently did on the open water of a lake. Wetlands like these perform important functions in our ecosystem. They are home to many species of birds, animals and insects. Wetlands serve as a filtration system for our rivers and lake by capturing sediments and toxic substances. They provide capacity in the ecosystem to absorb floods and large waves – there aren’t a lot of large waves on the lakes I travelled, but wave absorption is very important in coastal wetlands. Due to the diversity of wildlife, wetlands provide recreational opportunities for birdwatching, hunting and fishing. Unfortunately many wetlands, especially those in populated areas, have been filled in and built over. They were considered wasted land since they couldn’t be farmed (although they are great for growing cranberries). Roads had to be built around or through them and they took up land that communities wanted for housing. In the community where I grew up I lived on Water street, which was so named for our proximity to the tamed river that runs through the middle of the city. The river used to meander with wetlands on either side and islands in the middle. Early in the life of the city the wetlands on either side were filled in – in most cases with garbage and construction waste. The river was straightened out with linear banks and dams along the route to control the flow and flooding. The river regularly floods as a result of the lack of wetlands to absorb the excess water in the spring. Now instead of a wide diversity of wildlife along the sides of the river, the space is reserved for human use. Canada contains 25% of the globe’s wetlands and 14% of Canada is covered with wetlands. We have a particular responsibility to protect these important parts of our local and global ecosystems. They serve as important stops for migrating waterfowl and help to recharge and filter our groundwater systems. We all have an obligation to support the preservation of our wetlands. 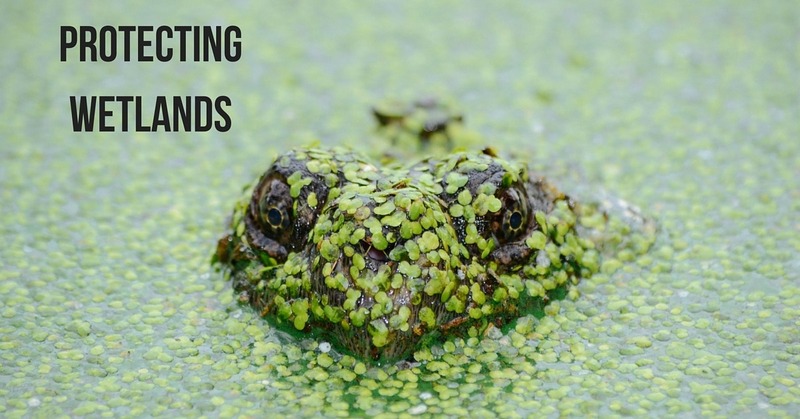 Just like I learned about the importance of wetlands in my youth, we have and can make opportunities as parents to educate our kids about protecting wetlands and preserving our overall ecosystems. Kids who attend the Minecraft theme week at Stem Camp this summer will have the opportunity to explore how wetlands work and their importance to environmental and human health.